Do you follow Tamilnadu politics ? and do you see political debates ….. with the assembly elections round the corner in Tamil Nadu and political parties, small and big, nervously planning to do their best, it seems some of them are unable to hold on to their nerves. On popular show on Thanthi TV, leader of the fringe Tamil-nationalist party ‘Naam Tamizhar Katchi’ , Seeman, and a senior leader of the CPI(M) Prof Arunan almost came to blows. The argument started heating up when the two politicians started sparring over who will get more votes, the PWA of which Left parties are a part of, or Seeman's party. With temperature soaring high, one called the other ‘loosu’ [derogatorily one not mentally stable] - An angry Arunan shot back, "You are loosu, who are you calling loosu?" – and this is the person who debated about ‘intolerance’ in talkshows !!! There are rich and there is poor too … centuries ago, Adam Smith wrote the book that is generally credited with initiating the science of economics. The central question he addressed is contained in its title, An Inquiry into the Nature and Causes of the Wealth of Nations. Think of an economy as reflecting three fundamental features: capital, labour and what was called the “efficiency factor” in a Forbes article. The efficiency factor determines how well the country turns capital and labour into output, and it is a major contributor to difference in GDP person in countries across the globe. Miles away, speculation regarding a new league came after Tuesday's meeting of officials from the Gunners and Premier League rivals Chelsea, Liverpool, Manchester City and Manchester United. Any impetus for a breakaway league is believed to come from clubs in mainland Europe due to the current financial strength of the Premier League. Arsene Wenger has been heavily criticised during the past few days with the Frenchman coming under fire after his side's display against Manchester United. 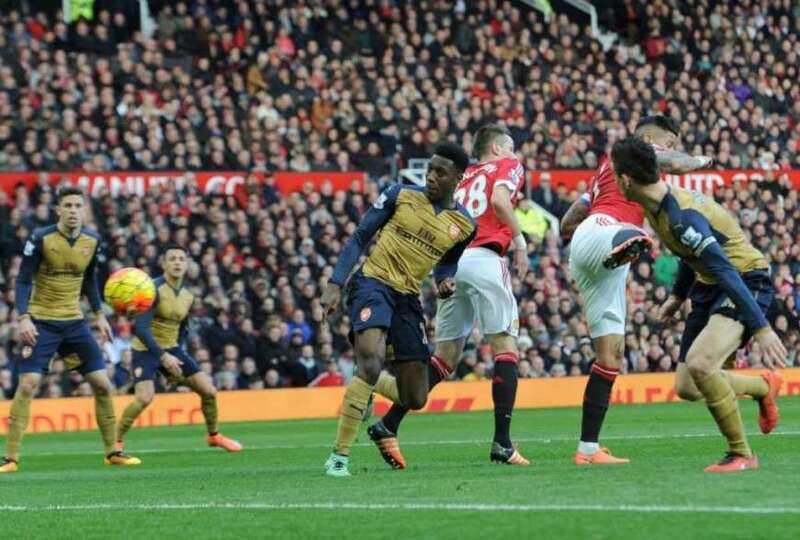 Louis van Gaal's side defeated the Premier League title contenders despite being unable to call on the services of several first-team stars. This is no post on football league but the references to the club are of a different kind. Arsenal Football Club is a professional football club based in Holloway, London. The club play in the Premier League, the top flight of English football. One of the most decorated clubs in English football, they have won 41 domestic and two European trophies, including 13 First Division and Premier League titles and a record 12 FA Cups. Arsenal were founded in 1886 in Woolwich and in 1893 became the first club from the south of England to join The Football League. In 1913, they moved north across the city to Arsenal Stadium in Highbury. In 2006, they moved to the Emirates Stadium in nearby Holloway. They have never left the top flight since 1919 – the ongoing longest run in English Football. Arsenal are one of the world's most supported clubs: Deloitte measures their 2014/15 social media following as the fifth highest in the world. The Gunners are currently owned by American Stan Kroenke's KSE UK Inc and Red and White Securities Limited … .. and this is about a man who has plans to buy the club. Rich enough to buy a famous club ! – he must be very rich and live in an opulent country. One part right – latter wrong ! – it is not rich and famous are from Europa and America – they are there in poorer countries of Africa too. Following several years of steady growth in Africa, the continent's wealthiest are facing a number of headwinds. The plunge in the price of oil and commodities has heavily impacted the elite earners. Yesterday I had posted about Bill Gates topping Forbes Magazine’s list of the world’s richest billionaires for the 17th time in 22 years. Though the 60-year-old Microsoft head is $4.2billion poorer than 2015, his net worth of $75billion has put him in the top spot of the spot on Forbes' World Billionaires list for the third year in a row, after overcoming Mexico’s Carlos Slim Helu in 2014. Helu came in fourth in Forbes’ 2016 list, behind Gates, Zara’s Amancio Ortega and business mogul Warren Buffett, respectively. The latest Forbes Rich List shows that the number of billionaires in Africa has taken a hit – from 28 down to 23. The group's fortune has also been impacted: the 50 wealthiest Africans are now worth a total $95.6 billion, a decline of $15 billion from a year ago. Among them is Dangote, who owns 90% of publicly traded Dangote Cement through a holding company – a percentage that exceeds the 80% ownership ceiling set by the Nigerian Stock Exchange. Dangote's spokesperson told Forbes that the company has until October 2016 to lower the 58-year-old's stake and has plans to do so by then. Born into a wealthy family in Kano in 1957, the young detribalised Dangote was only 20 when he established his small trading business in 1977, focusing on commodities and building supplies. He reportedly launched his business after his uncle lent him 500,000 naira. He inherited three cement trucks from his grandfather - as was the practice then - and took out a loan repayable over two years. Because cement was a scarce and expensive commodity at the time in Nigeria, the business rapidly grew, and after incorporating a number of companies in the early 1980s, the business became Dangote Cement. Today, the Dangote group is the largest business conglomerate in West Africa, with a market capitalisation of $15.5bn, and supplies telecoms, textiles, and commodities such as cement, sugar, salt, and rice at competitive prices. Spanning across numerous sectors of the Nigerian economy, the group is the largest private employer in Nigeria, and invests in 18 countries across Africa. His cement plant of Obajana - located half-way between the economic capital Lagos and the political capital Abuja, is poised to soon become the largest in the world, capable of filling up a 30 tonne truck every 30 seconds. By 2014, Dangote peaked on Forbes' list as the 23rd richest person in the world. However, plunging oil prices, falling stock prices, and dwindling dollar reserves in Nigeria, were expected to badly affect Dangote. By November 2014, after the Naira devalued 10%, his fortune had slumped to $7.8 billion. 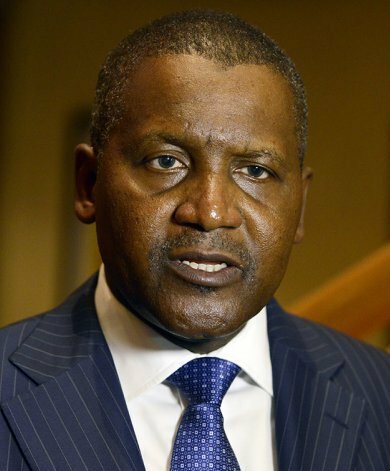 But now in December 2015, Dangote remains the richest man in Africa and the 67th richest person in the world, according to Forbes. His company opened up to new markets, notably Brazil and Indonesia, and retained its real estate and transport businesses. It is reported that within the next few years, Dangote Group could provide almost 10% of Nigeria's GDP - the largest economy in Africa - and employ up to 22,000, on completion of ongoing projects. Known for having said: "If you give me today $5bn, I will not invest any abroad, I will invest everything here in Nigeria. Let us put heads together and work", the mogul had declared an interest in buying Arsenal Football Club.